In this paper, we propose an efficient scheme for side peak cancelation in binary offset carrier (m,n) (BOC(m,n)) with integer modulation order. The proposed scheme reduces significantly the width of the main peak of the auto-correlation function (ACF) and thus the range of influence of the multipath (MP) in BOC-modulated signals. It is based on the use of reference ACFs like that of ideal pseudo random noise (PRN) code generated by linear feedback shift register (LFSR) and used in global positioning system (GPS) and the Russian Globalnaya Navigatsionnaya Sputnikovaya Sistema (GLONASS). In MP environment, the proposed method is used in combination with fast iterative maximum likelihood algorithm (FIMLA) that is adapted to future modernized GPS and Galileo signals. 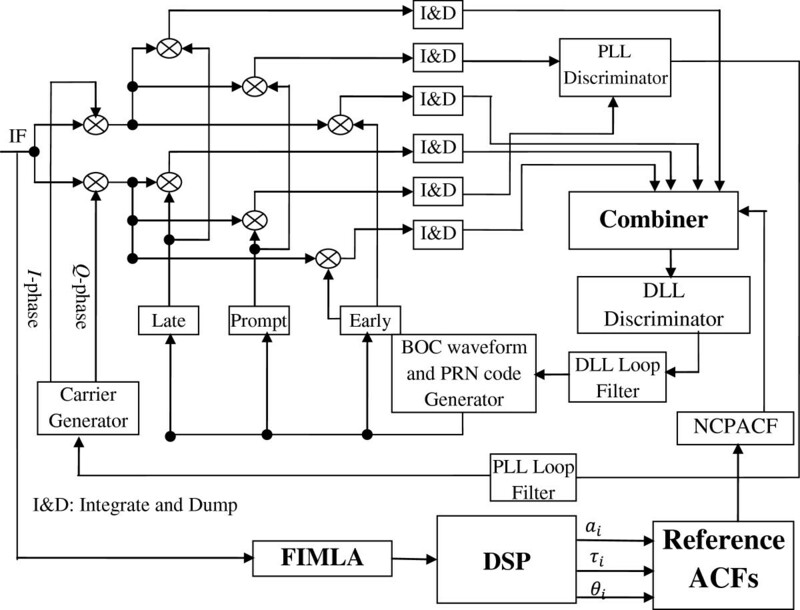 As a result, the obtained ACF of the proposed scheme does not contain any side peaks, and thus, the discriminator function (DF) has no ambiguity in the delay-locked loop (DLL) code tracking operation. The simulation results show that the proposed technique has superior performances in MP mitigation and permits the same resistance to noise compared to the traditional techniques. Binary offset carrier (BOC) modulation is well known by its symmetric split power spectrum with two main lobes shifted from the carrier frequency by an amount equal to the sub-carrier frequency and with a null at the carrier frequency . This null which permits frequency sharing along with current binary phase-shift keying (BPSK)-modulated signals, such as global positioning system (GPS) coarse/acquisition (C/A) code, represents the primary benefit of BOC modulation. Besides, it has been shown in  that BOC modulation offers significant benefits over comparable BPSK modulation, such as, ease of implementation, better code tracking accuracy, multipath (MP) mitigation, and interference rejection. However, this type of modulation still suffers from the challenging ambiguity caused essentially by the presence of multiple peaks in the shape of the auto-correlation function (ACF), which represents a limitation. Several techniques have been developed to deal with this problem. In fact, the BOC-pseudo random noise (PRN) ACF has been introduced first by Dovis et al. for sine-BOC(1,1)-modulated signals. Instead of multiplying the received signal by a locally generated replica of sine-BOC(1,1) in the code tracking loop, this technique multiplies only by the PRN code. The ACF resulting from this multiplication can be used directly as an error signal in the code tracking loop, acting therefore as a discriminator function (DF). This method, even though it is unambiguous and presents low hardware complexity over a large range of code offset delay , it is limited by the influence of MP signals, since it behaves like a wide correlator (WC). In  and , the authors have proposed the BOC-PRN (early + late) (BOC-PRN(E + L)) DF, used respectively for sine-BOC(fs,fc)even and MBOC modulations. 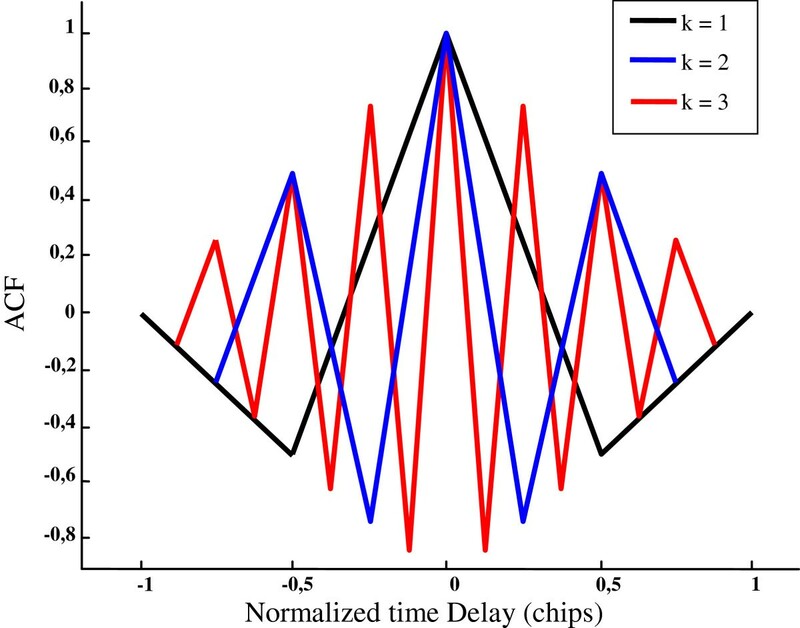 In contrast to the traditional delay-locked loop (DLL) in which we employ early-minus-late correlators for DF computation, the method in  and  employs early-plus-late correlators. The BOC-PRN(E + L) discriminator eliminates side peak ambiguity, while it cannot insure good MP mitigation . In , the extended BOC-PRN discriminator for cosine-BOC(fs,fc) signals was developed in order to handle both ambiguity and multipath effects at once. However, the tracking dynamic performance and sensitivity could not be guaranteed by its stand-alone implementation which is limited by a narrower hold-in range . In addition, as it will be shown later, the extended BOC-PRN discriminator presents a reduced resistance vis-à-vis the noise. Another approach called ACF side peak cancellation technique (ASPeCT)  is based on the combination of two ACFs, and it is used exclusively for sine-BOC(n,n)-modulated signals. In order to remove the side peak ambiguity, the BOC-PRN ACF, which is the ACF between the received signal and locally generated PRN code, is subtracted from the ACF of the received signal. The ASPeCT tracking technique has been shown  to be reliably unambiguous and able to be adapted to different front-end filter bands in the receiver. Nevertheless, because both the received signal ACF and BOC-PRN ACF are affected by noise, their combination will introduce an additional amount of noise. 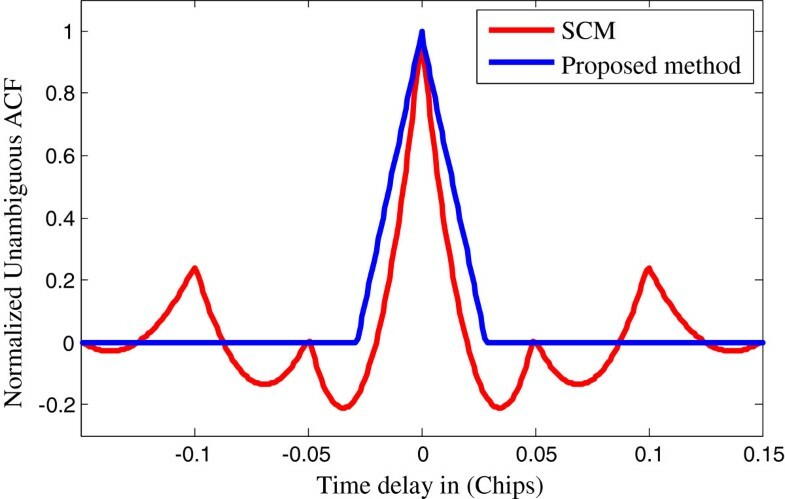 In reference , the authors have proposed a side peak cancellation method (SCM) at tracking stage. Compared to ASPeCT, it has the advantage of providing lower complexity solution and is applicable to any sine or cosine, odd or even BOC modulation case. Besides, in the same paper, the authors studied the performances of the SCM with five different tracking loops and showed that the highest performance improvement is reached when combining with the narrow early-minus-late (EML) correlators and that the higher the BOC modulation order, the more advantageous it is to apply the SCM technique in order to cope better with the false lock points . However, there are still some side peaks present in the resulted SCM ACF that can affect the tracking process and thus influence the MP reduction. In , Yanling et al. presented an alternative unambiguous tracking technique for sine-BOC(1,1)- and MBOC(6,1,1/11)-modulated signals. This method is based on the combination of the ACF and absolute ACF (AACF) in the coherent EML correlator architecture loop. Even though it seems to be attractive in the ideal case, this later method presents severe performance degradation in the presence of MP with phase of 180° with respect to the line of sight (LOS). In [10–12], the authors have used the concept of the step-shape code symbol (SCS) signals, proposed first in , to propose three unambiguous methods given separately in [10–12]. The first one , which is applied for CBOC modulation signal in non-coherent tracking configuration, uses a discriminator based on a pseudo correlation function (PCF). Hence, the received CBOC signal is first correlated separately with two specific 1-level SCS spreading symbols to produce two ACFs. Then, the PCF is obtained by combining those resulting ACFs. As a consequence, the method gives better performances in ideal situations. Yet, in the actual case, the method is limited by the presence of noise because it involves blanking a significant part of the received signal. In addition, its ACF (PCF) is completely deformed in the presence of MP which is another limitation . The second method, developed for sine-BOC(kn,n)-modulated signals, is called general removing ambiguity via side peak suppression (GRASS) technique . Its principle consists of subtracting the cross-correlation function between the locally generated auxiliary SCS signal and the received sine-BOC signal from the ACF of the received sine-BOC-modulated signal. Nevertheless, the MP performances are more and more degraded as the modulation order M becomes higher (M > 2) . Finally, the third SCS-based method, called PCF-based unambiguous delay-locked loop (PUDLL) , uses two local SCS signals that are separately cross-correlated with the received sine-BOC(kn,n)-modulated signal. The obtained results are then combined to find the unambiguous PCF. This method is applicable only to sine-BOC(kn,n), with k as a positive integer. Also, it provides better tracking performance only for small values of k, in comparison with the BOC(kn,n) ACF . In , a recent scheme for side peak cancellation was proposed by Rouabah et al. with two versions. It is based on the use of reference ACFs in combination with the MLE of MP and was shown to completely eliminate side peaks and to mitigate MPs. Nevertheless, this latter technique is restricted to only BOC(n,n)-modulated signals, which makes it less general compared to BOC(m,n) cancellation methods. One method proposed by Garin (shaping correlator receiver) , applicable to only BOC(n,n), succeeded to improve MP mitigation without completely removing side peaks in the proposed correlator output. In , Yang et al. have proposed the quadratic BOC tracking correlator (QB-TC) using both sine-BOC and cosine-BOC locally generated signals, which are processed separately with the received signal through a correlator followed by a non-coherent DLL. The two DFs obtained are added to give a QB-TC BOC DF. This QB-TC tracking loop removes completely the ambiguity. However, it does not present a good MP mitigation. Recently, several unambiguous methods appeared with better performance than the aforementioned ones, for instance, the enhanced double delta correlator (∆∆C)  which is an unambiguous strobe correlator (SC) tailored to Sin-BOC(1,1) signal tracking using both coherent and non-coherent structures. 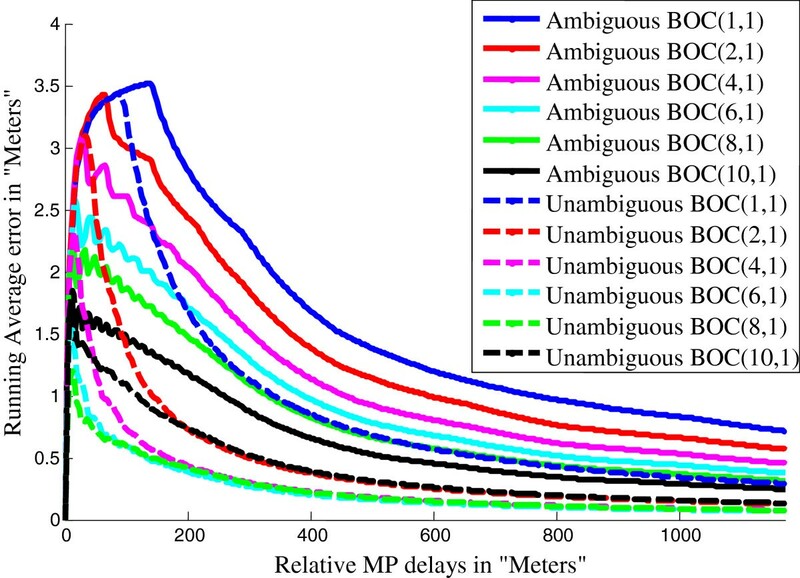 It improves medium-delay MP error and achieves equivalent MP mitigation to the shaping correlator at the cost of degraded noise resistance . Also, there is a method based on the concept of s-curve shaping for alternative BOC (AltBOC)-modulated signal, presented in . Although it shows better performance in terms of MP and side peak reduction than the conventional receiver ACF techniques, it is limited by the noise. Finally, we can include the PCF-based, unambiguous tracking method  dedicated to AltBOC(15,10) signal. This latter exhibits an average MP performance with respect to the existing methods and has also less robustness to noise. In this paper, we propose a side peak cancellation technique for sin-BOC(m,n) with integer modulation order. It uses several PRN ACFs that can be locally generated one time and stored in memory. In the receiver end, they are extracted from the memory and combined using the MP parameters (amplitudes, delays, and phases) estimated by fast iterative maximum likelihood algorithm (FIMLA), with the ambiguous ACF of the received signal, after a phase of alignment. Consequently, our proposed method provides less time consumption with an average complexity. Besides, the resultant ACF presents a sharper peak which improves the MP mitigation performances. Moreover, since the resultant ACF has no side peaks, the proposed technique can be combined with all the proposed methods used for MP mitigation in classical GPS codes, such as high-resolution correlator (HRC) , multipath estimating DLL (MEDLL) , and the virtual MP mitigation technique (VMMT) , in order to improve its performances in the presence of MPs. The paper is organized as follows: we start with a description of the ACFs of BOC-modulated signals followed by a presentation of the side peak ambiguity problem. After that, we present the proposed side peak cancellation method followed by an example of application and a comparative study of DLL performance with previous methods. Next, the proposed method is considered in the presence of MP, and the block diagram of the proposed method is presented. Finally, the simulation results together with performance comparison between the proposed method and some other aforementioned ones are given. where fsc = 1/2Ts is the sub-carrier frequency, fc = 1/MTs = 1/T X , is the code chipping rate, Ts is the sub-carrier half period, T X is the BOC modulation code chip duration, M = 2 m/n is an integer called the modulation order which represents the number of sub-carrier half periods in a code chip. with l = ⌈τ/Ts⌉, ⌈⌉ represents the ceiling operator, and τ is the shift in time delay of the locally generated code. The aforementioned advantages of BOC modulation come at a price, namely the difficulties in acquiring and tracking signals. 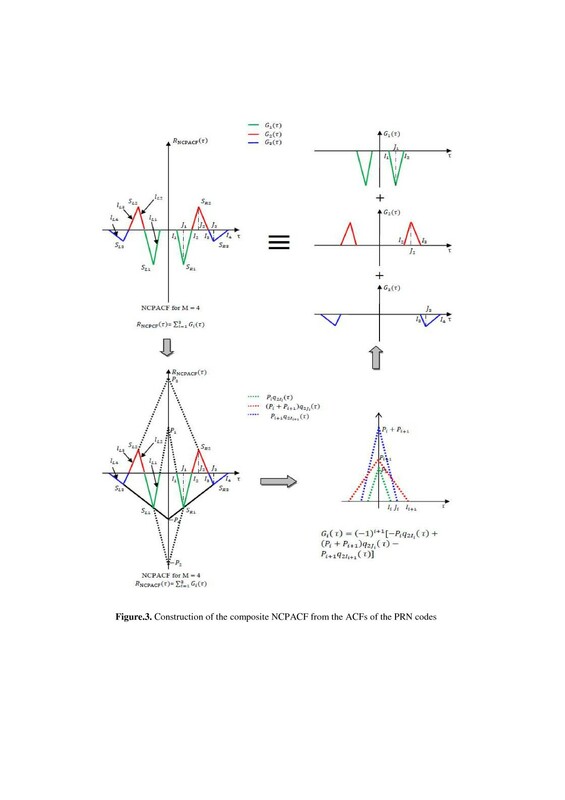 Figure 1 shows the ACF of an ideal sine-BOC(kn,n) modulation (k integer) for different values of k. The ACF of an M order sine-BOC(kn,n)-modulated signal consists of one central peak and M - 1 different alternated negative and positive couples of symmetric side peaks . ACFs of BOC( kn , n ). Consequently, as depicted in Figure 2, for BOC(2,1)-modulated signal case, several zero crossings appear in the DF. Thus, the DLL can lock on a side peak which creates deep ambiguities around the central peak of the ACF (into the range of ±1 chips). Ambiguities around the central peak for BOC(2,1)-modulated signal. The proposed side peak cancellation method is based on the generation at the receiving end of the composite no-central peak ACF (NCPACF), which is the sine-BOC ACF without the central peak. The NCPACF is generated as a combination of reference ACFs of several locally generated PRN codes. Figure 3 shows the principle of generating NCPACF. Construction of the composite NCPACF from the ACFs of the PRN codes. We give in what follows the principle of calculating this composite NCPACF. From Figure 3, we can define SLi and SRi as, respectively, the left and the right side peak of the i th side peak couple (SLi, SRi) starting from the nearest to the central peak, with i = [1,2….,M - 1]. Also, it should be noted that the first couple of side peaks (i = 1) is always negative. where, G i (t) is the time function representing the i th side peak couple. where p i is the i th triangular pulse's peak amplitude, which is given by the absolute amplitude of the line segment lRi intersection with the ordinate axis. I i is the zero crossing value of the i th line segment lRi, situated at the right of the central peak. J i is the SRi side peak location value situated at the right of the central peak. R NCPACF τ = ∑ i = 1 M - 1 - 1 i + 1 P i + P i + 1 q 2 J i t - q 2 I 1 t + q 2 I M t .
P i = b i = i + M - i 2 i - 1 M .
J i = i T X M .
Equation 14 shows that the NCPACF can be seen as a combination of M + 1 reference ACFs which can be generated respectively by M + 1 locally generated PRN codes. To allow a less time-consuming and simpler approach, these reference ACFs are generated for different BOC modulation schemes and stored in memory. where RAmb(τ) is the ambiguous ACF of the received signal, a ̂ : is the estimated amplitude of the received signal, and θ ̂ : is the estimated phase of the received signal. An example of application of the proposed method is illustrated in the Figure 4. Example of application of the proposed side peak cancellation method for BOC(3,1) ACF. In the top left of Figure 4, the received signal which is sine-BOC(3n,n)-modulated (i.e., M = 6) is presented. The top right of Figure 4 shows the required M + 1 = 7 reference ACFs, whose combination gives the NCPACF which is presented in the bottom right of Figure 4. This NCPACF is then subtracted from the received signal ACF to end up with the completely unambiguous ACF depicted in the bottom left of Figure 4. Hence, as shown in this figure, by using the proposed method, we can obtain, like no-BOC ACF, an ideal unambiguous ACF. Moreover, this latter method presents a sharper central peak whose base line width and height, are, in ideal case, the same as those of the received signal ACF's main peak. Therefore, the proposed technique improves considerably the tracking stage performance. We present in Figures 5, 6, and 7 the DLL DFs of, respectively, BOC(1,1), BOC(4,1), and BOC(15,10) before and after the application of the proposed method. We observe for each case the presence of only one zero-crossing in its corresponding unambiguous DF. Consequently, in contrast to the traditional BOC, the resultant DFs of the proposed method are similar to those of no-BOC ones, but with higher zero crossing slope values. 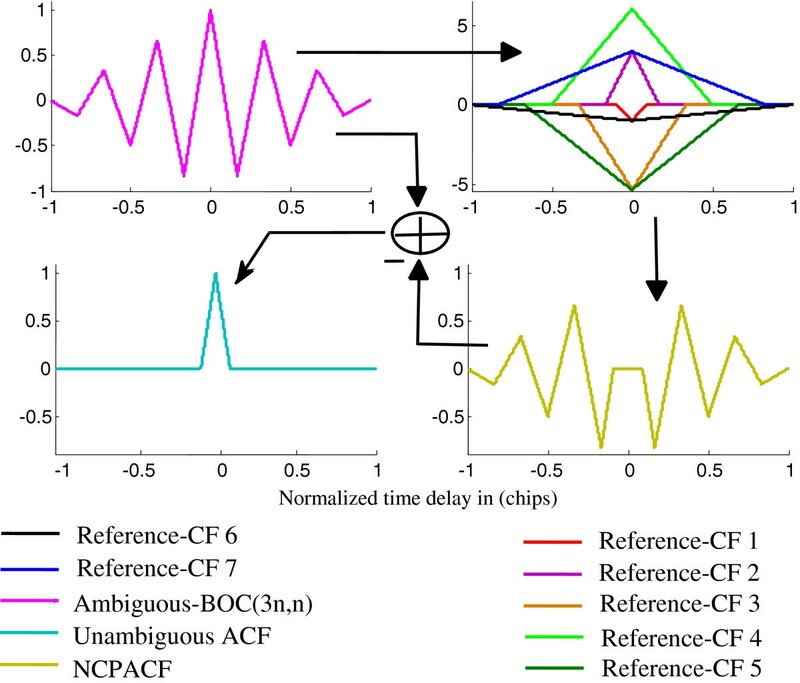 Normalized DFs of BOC(2,1)-modulated signal for both traditional and proposed methods. Normalized DFs of BOC(8,1)-modulated signal for both traditional and proposed methods. Normalized DFs of BOC(15,10)-modulated signal for both traditional and proposed methods. Step 1 Initialization. 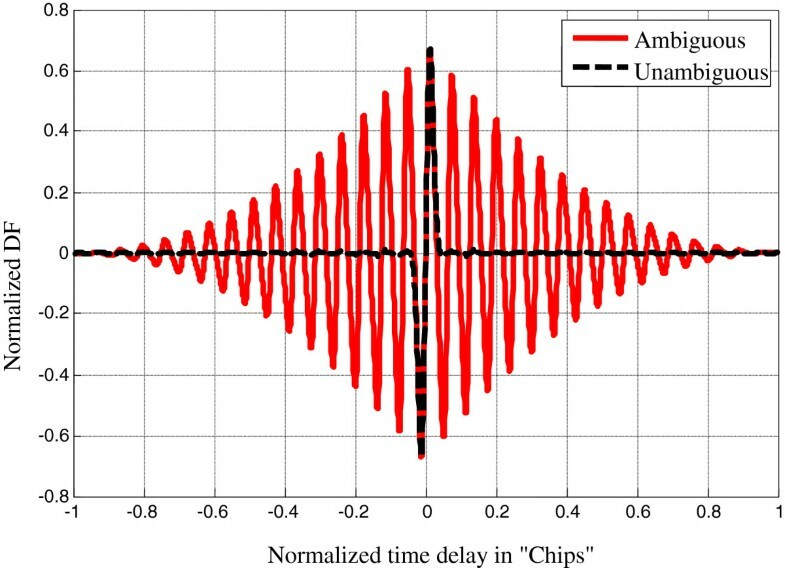 Initialize the algorithm by applying any adequate method to compute an initial delay estimate τ ̂ 0 .
where fd is the intermediate frequency that includes the Doppler shift. 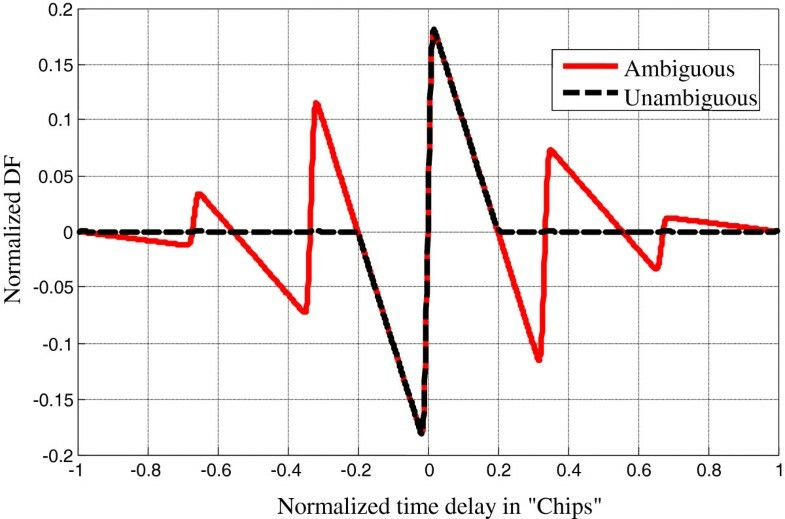 The sampling rate may be set to T e = T c 2 , for example (Tc is the duration of PRN chip). where δ is the early-late spacing used to calculate the first and second derivatives, and τ ̂ k is the estimated delay at the k th iteration. with a1 as the amplitude of MP component, τ1 the delay of MP component, a0 the amplitude of LOS component, τ0 the delay of LOS component, n(t) the white Gaussian noise, c(t) the PRN code modulated with the sub-carrier, and fd the intermediate frequency plus Doppler. R sc 2 τ ̂ 0 = ∫ T 0 s t e - j 2 πf d t - a 0 c t - τ ̂ 0 c t - τ ̂ 1 dt . Note that the FIMLA algorithm is implemented in a coherent form. Thus, the true values of the phases are estimated as in the MEDLL algorithm . The block diagram of our proposed method is shown in Figure 8. Block diagram of the proposed side peak cancellation method. As shown in this figure, The FIMLA estimated parameters of all components of the received signal are used to generate the composite NCPACF which is combined with the ACF of the received signal to perform the side peak cancellation. The simulations are conducted to test the proposed method. For this reason, four scenarios of performance measurement are conducted. In the first one, two methods have been simulated: traditional scheme with BOC(m,n)-modulated signals ((m,n) = (1,1), (2,1), (4,1), (6,1), (8,1), and (10,1)) and our proposed method with the same BOC(m,n)-modulated signals. The pre-correlation bandwidth is chosen which is equal to 24 MHz. The simulations are performed in a scene containing a LOS signal and one MP signal. This latter MP has an amplitude of 0.5, and it is varied in delay from 0 to 1,200 m with respect to the LOS. The evaluation of the performances is done by the computation of the running average of the envelope error. This is realized by calculating the absolute error envelope values and their cumulative sum. The criterion used herein is that used in . The results are shown in Figure 9. 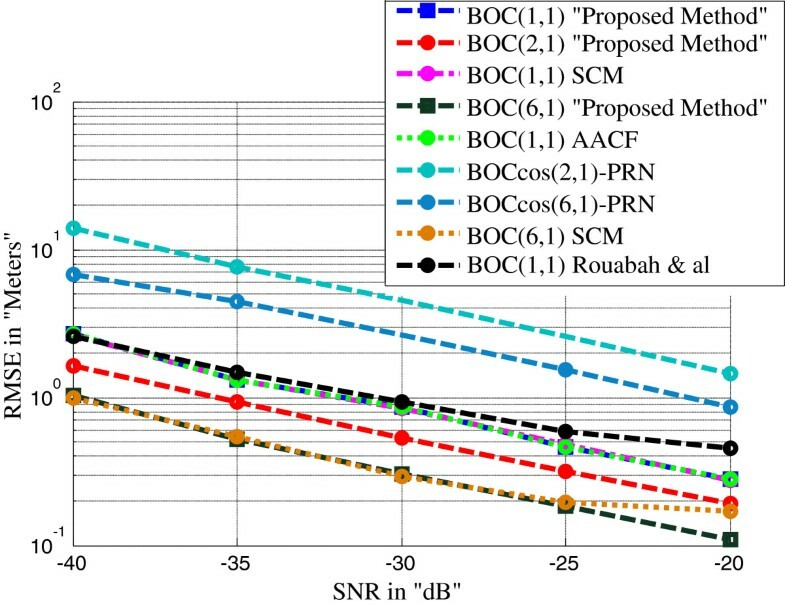 Comparison of running average errors of the BOC( m , n )-modulated signals with the classical and proposed methods. Comparison of running average errors of BOC(1,1), BOC(2,1), BOC(4,1), BOC(6,1), BOC(8,1), and BOC(10,1) with classical method and those of BOC(1,1), BOC(2,1), BOC(4,1), BOC(6,1), BOC(8,1), and BOC(10,1) with the proposed method. As illustrated in this figure, the proposed method shows the best overall MP performance than the traditional scheme. Its running average errors, for all precedent BOC(m,n)-modulated signals, decrease to zero more rapidly to achieve their less value, which makes it sensitive only for short MP delays. Besides, the bands of variation of the bias of the proposed method are less than those of the traditional scheme. In the second situation, all the assumptions of the first scenario are maintained to compare our proposed scheme with BOC(1,1), BOC(2,1), and BOC(6,1) waveforms to three other schemes: AACF method with BOC(1,1) waveform; SCM method with BOC(1,1), BOC(2,1), and BOC(6,1) waveforms; and BOC-PRN method with cosine-BOC(2,1) and cosine-BOC(6,1) waveforms. In fact, all these schemes have been simulated, and the corresponding results of the running average errors are shown in Figure 10. Running average errors. Comparison of running average error of BOC(1,1), BOC(2,1), and BOC(6,1) with our method to BOC(1,1) with AACF method, BOC(1,1) and BOC(6,1) with SCM method, cosine BOC(2,1) and cosine BOC(6,1) with BOC-PRN method, and Rouabah et al. (BOC(1,1)) method. 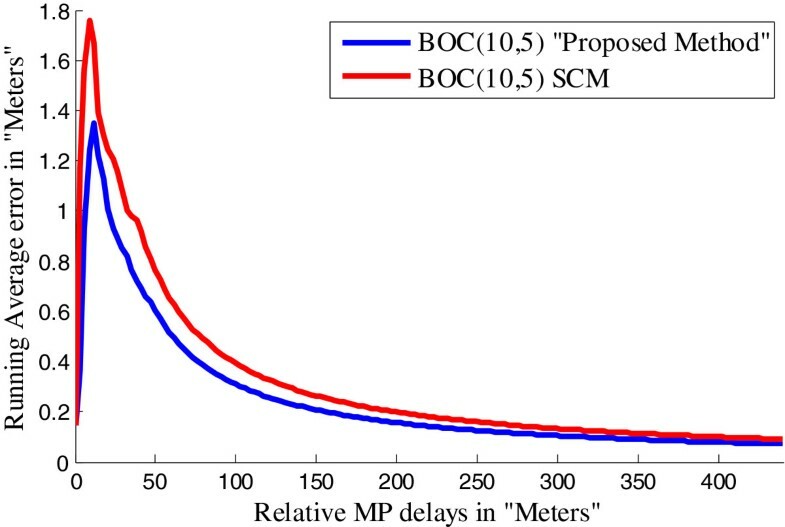 As illustrated in this figure, our proposed scheme shows the best overall MP performances compared to all the other schemes for both low and high modulation orders and for any MP delay's value in the sense that it is only sensitive for short MP delays, which shows its better MP rejection. It should be noted however that even though the SCM method works also for generic BOC(m,n), several side peaks of reduced amplitudes are still present in its ACFs as shown in Figure 11 for BOC(10,5) reported in . These later may be considered as MP ACFs on either side of the central peak which explains the increased MP envelope error and thus the increased MP running average error with regard to those of our proposed method as illustrated in Figure 12 for the same case of BOC(10,5). Resultant BOC(10,5) ACFs of the proposed method and SCM method. 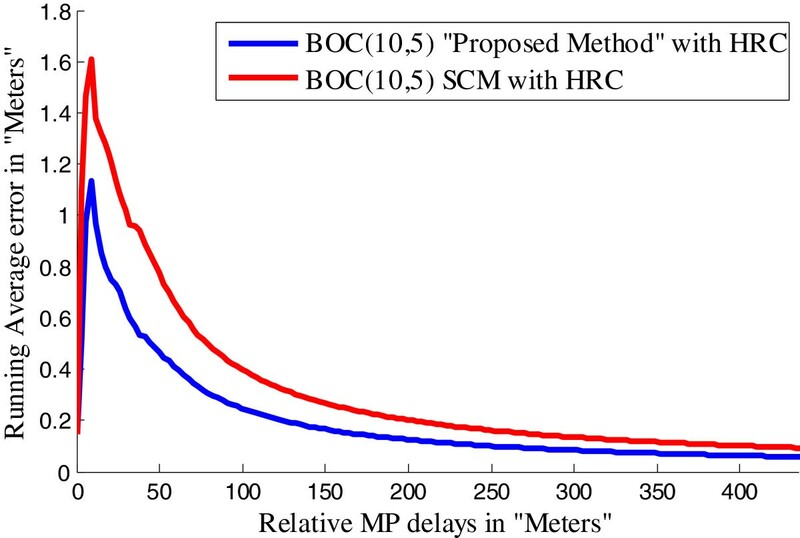 Comparison of running average errors of BOC(10,5) of the proposed method to BOC(10,5) of SCM method. In the third mechanism of performance measurements, the simulations are conducted to test the effect of the signal-to-noise ratio (SNR) on the performances of the proposed method. 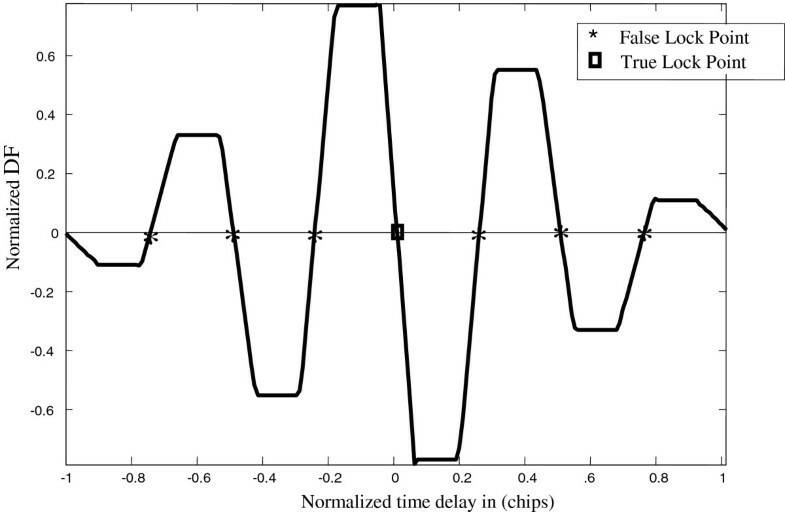 The results of comparison of the root mean square errors (RMSEs) of code tracking of the seven precedent waveforms are given in Figures 13 and 14. 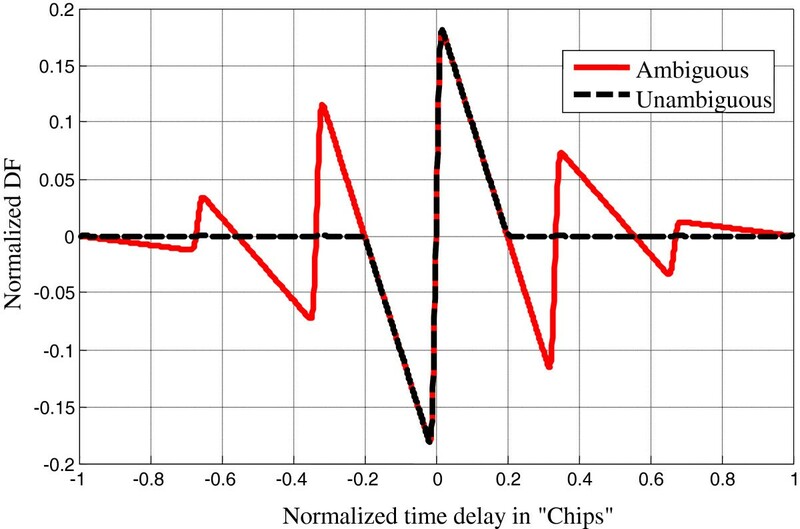 RMSE of the LOS signal delay estimation versus SNR. Comparison of our proposed method (BOC(1,1), BOC(2,1), and BOC(6,1)) with SCM method (BOC(1,1) and BOC(6,1)), AACF method (BOC(1,1)), BOCcos(2,1)-PRN method, BOCcos(6,1)-PRN method, and Rouabah et al. method (BOC(1,1)). RMSE of the LOS signal delay estimation versus relative MP delay. 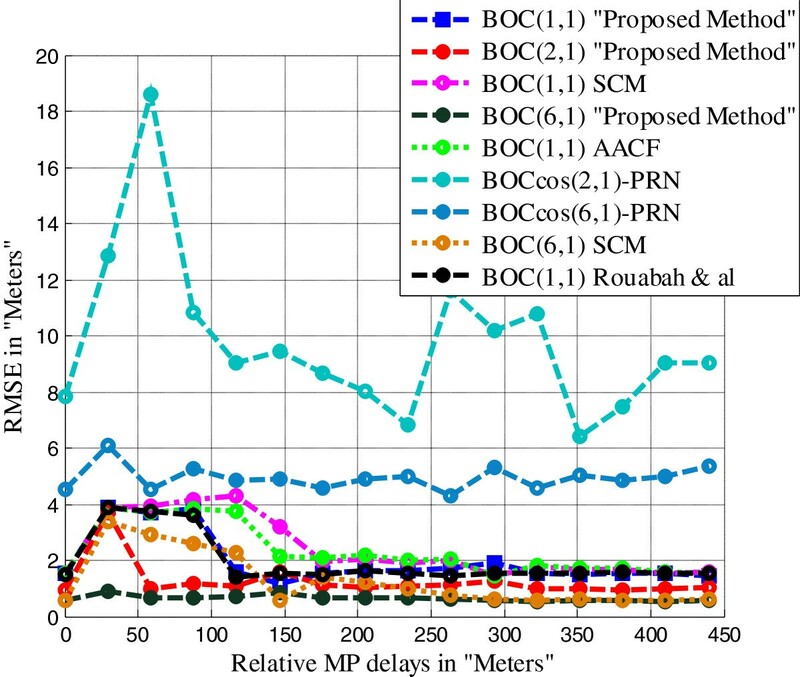 Comparison of our proposed method (BOC(1,1), BOC(2,1), and BOC(6,1)) with SCM method (BOC(1,1) and BOC(6,1)), AACF method (BOC(1,1)), BOCcos(2,1)-PRN method, BOCcos(6,1)-PRN method, and Rouabah et al. method (BOC(1,1)). Firstly, the simulation is realized without MP, and the early-late spacing is taken equal to T c/10. The results are shown in Figure 13. As illustrated in this figure, the RMSEs are represented versus SNR which varies from -40 to -20 dB. The small RMSE for the proposed method through the whole SNR range confirms the applicability of this simplification. In fact, this figure reveals that at low SNR, the proposed method performs like SCM but better than BOC-PRN. This could be explained by the fact that the BOC-PRN brings more noise in the DLL loop. 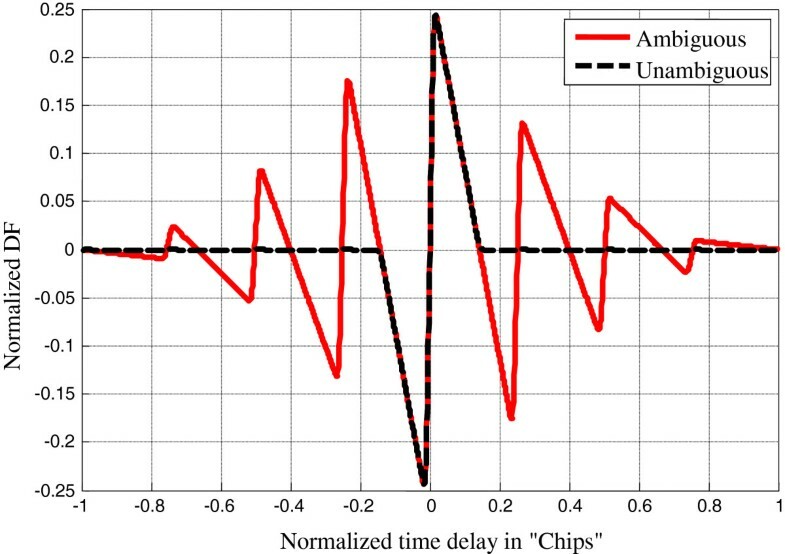 Secondly, the simulation is realized with an MP in phase with LOS, having an amplitude of 0.5 and a delay that varies from 0 to 450 m with respect to the LOS. The result, with SNR chosen equal to -30 dB, is shown in Figure 14. 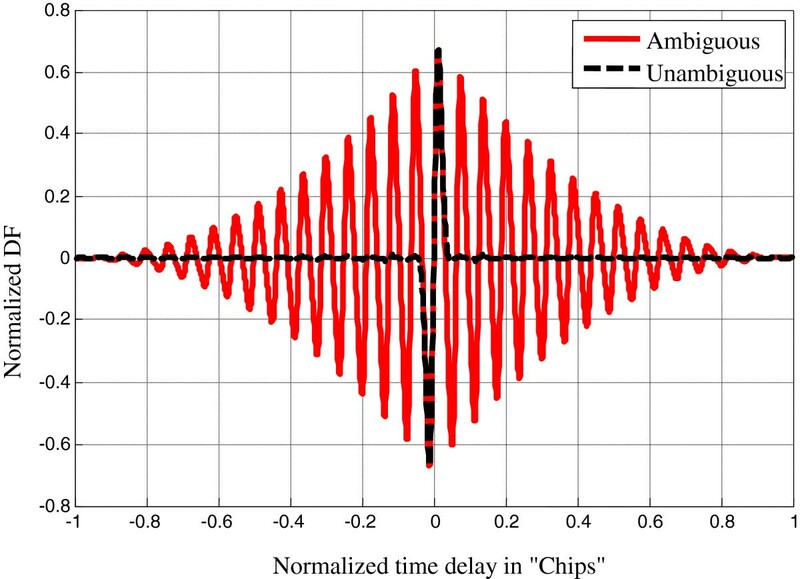 As illustrated in this figure, for all modulation orders and almost all the values of MP delay, our proposed method presents a low RMSE with regard to what we observe for all the other methods. This shows the resistance of our method vis-à-vis the noise and the MP. Finally, all the assumptions of the first scenario are also taken into account to compare our proposed scheme combined with HRC to SCM combined with HRC. The results are shown, through the running average errors, in Figure 15. It is clear from this figure that the performances of our proposed scheme, in combination with HRC, are better than those of SCM in combination with HRC. The running average error of our proposed scheme, in combination with HRC, decreases rapidly to zero which proves the compatibility of our proposed scheme with the HRC scheme originally proposed for MP mitigation in no-BOC signals. Running average errors of the proposed method and SCM method. Comparison of running average errors of the proposed method with HRC scheme BOC(10,5) code and SCM method with HRC scheme BOC(10,5) code. 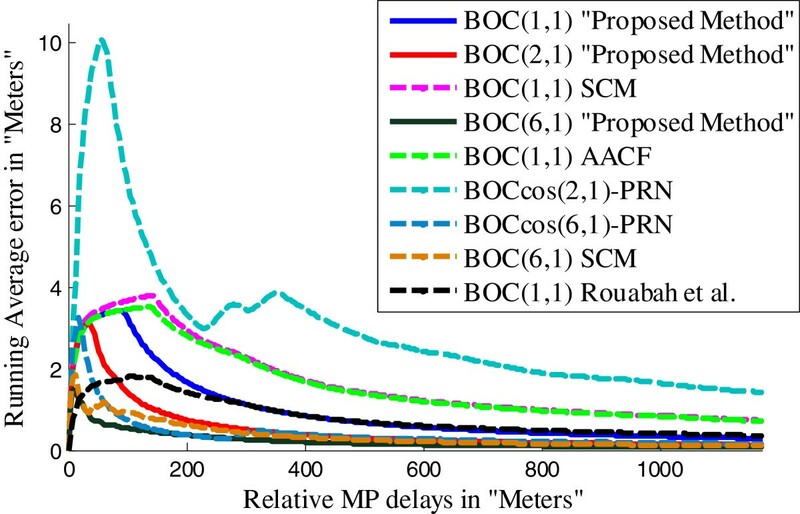 In this paper, an efficient method for side peak cancellation in BOC(m,n)-modulated signals (with M integer) is proposed. It is based on the use of reference PRN ACFs that are judiciously combined to generate a received BOC-modulated signal's ACF replica without a central peak. With the use of FIMLA in the receiver's algorithm, the so-obtained NCPACF is combined with the received signal ACF. The resulting ACF is completely unambiguous and presents a sharper central peak. Hence, all the methods proposed for MP mitigation in no-BOC-modulated signals such as HRC, SC, and VMMT are practical for our proposed method. Consequently, the use of our proposed scheme in combination with these techniques will give much better results. Besides, the proposed method provides a less time-consuming and simpler approach, since it uses ideal reference PRN ACFs, which are generated only once and can be stored at the receiver stage. The simulation results have shown that the proposed method has better performance in terms of MP mitigation and MP variation band reduction.